Jobspire, a hiring portal that allows startups to visually describe their work environment, has secured $262,000 in seed funding from Purvi Capital LLC, a Chicago-based investment firm. Willfly Ventures, Nikunj Jain (co-founder, Frankly.me), Krishna Jha (co-founder, Telnet Ventures), Sanjay Bakshi (co-founder, Impulse Marketing), Kapil Nayyar (partner, International Business Advisors) and Artieca Trust have also put money in this round, as per a press statement. Bangalore-based Jobspire Technologies Pvt Ltd, which owns and operates Jobspire, will use the money raised to scale its team and strengthen the technology platform. "It’s an extremely nimble founding team that understands how millennials filter career opportunities. 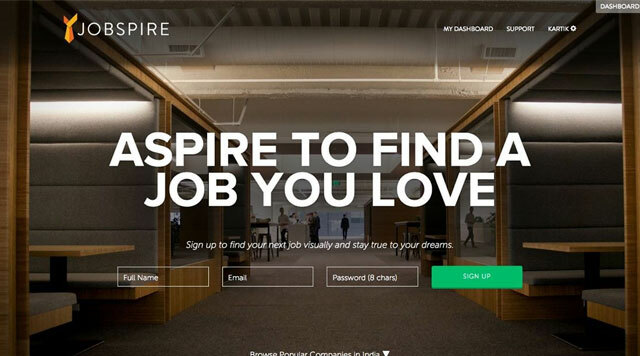 Jobspire is a fresh approach to how companies brand, connect and recruit in an increasingly competitive talent market,” said Ravi Srivastava, lead investor at Purvi Capital. Jobspire helps startups and SMEs create an experiential company profile, allowing them to visually describe their work environment and talk about growth plans. It allows candidates to show their prowess by completing quick challenges instead of applying with a CV. Jobspire was founded by Mohak Dhingra, Kartik Luke Singh, Sandesh Kini and Varun Mayya in August 2014. All the founders are alumni of Manipal Institute of Technology. "While some companies source from us, other companies use our curation services, some even replace their careers page with their Jobspire page. Smaller companies use us as a platform to help them get discovered. We're currently experimenting with pay-per-hire (model), which is a challenging model to scale but one that our proprietary technology is really helping us crack,” said Kini, co-founder and COO at Jobspire. The startup claims to have 30-50 daily active applicants and over 1,000 daily users. About 91 companies hire from Jobspire, it said. Tech startups generally face umpteen challenges in getting the right talent in India as they compete with big names such as Amazon, Flipkart, Snapdeal and others for engineers. Different recruitment firms use different models to help startups find the right match. Online hiring platform ZenRadius, which assists startups to find talent through social networks, recently raised an undisclosed amount in seed funding from startup incubator Tracxn Labs and recruitment solutions firm Anzy Careers’ founder Deepak Singh. While TalentPad uses analytics to screen candidates, Venturesity conducts hackathons for startups to identify and hire the right fit. Recently, TalentPad raised its first round of funding from Helion Venture Partners while Venturesity bagged angel investment from a bunch of high profile investors such as Phanindra Sama, Jay Sethuram, Hemant Kanakia and others. Also, technical recruiting platform HackerRank raised $7.5 million from Japan’s Recruit Holding besides existing investors.